Sherlock Holmes Calendar 2018. A Strand Magazine exclusive- the Sherlock Holmes Calendar – 2018 here, and for years has been our bestselling gift item. Full color calendar celebrating The Great Detective with quotes, and trivia related to Sherlock Holmes and Arthur Conan Doyle. Beautiful spreads with photos and illustrations of Sherlock Holmes, including scenes from the Canon by Sidney Paget. We have a great line-up of themed months in this year’s calendar including, Sherlock Holmes in the Country, The Casebook of Sherlock Holmes, the Many faces of Dr Watson, Sherlock Holmes and dogs, Sherlock’s tools of deduction, and much more! 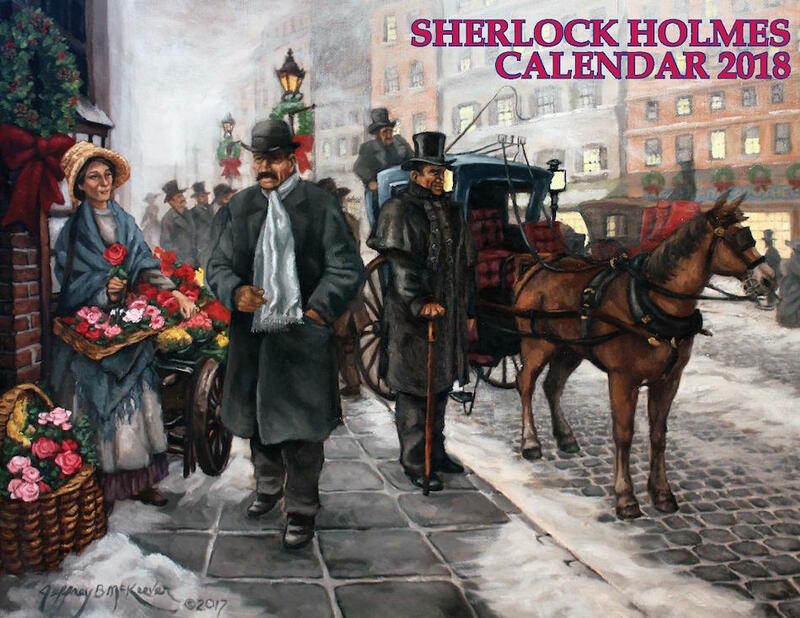 We also have Sherlock Holmes in the old Strand Magazine with magazine covers of the legendary magazine, and the exclusive “Flowers for Mrs. Hudson” painting by Jeffrey McKeever. Our quotes and trivia section looks at everything from the day that Sherlock Holmes was born to the publication dates of several short stories and novels from the cannon. Our calendar is printed on heavy card stock and will last as collector’s item for many years to come! Also, the calendar is coil bound which means that it’ll open smoothly and will never ever tear! Full color, 11×17 on glossy paper. A collector’s item that will last for years. Sherlock Holmes Calendar – 2018 is a Strand Magazine exclusive.